This is Conductor Dangerous BoB, and he's quite the character. 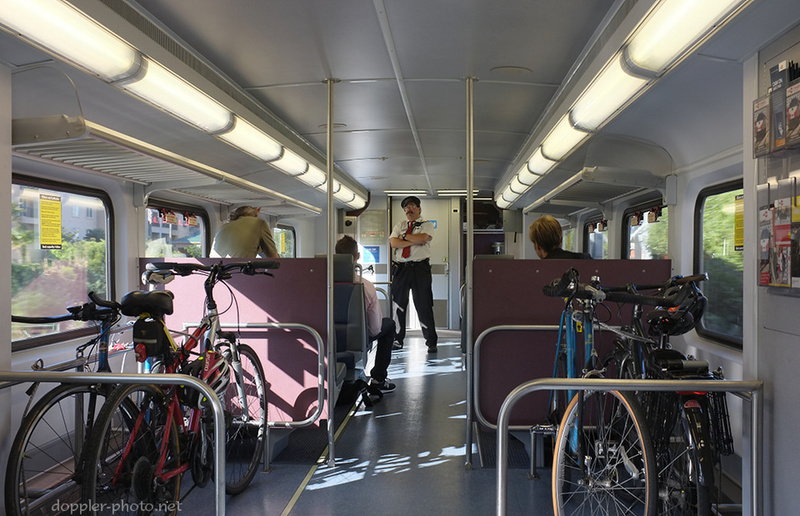 I first took actual notice of him as I was sitting in the bike car and I overheard him telling stories about the history of the train industry in the Bay Area, at which point I moved closer to get a better listen. As with anyone who's been in a given field for awhile, BoB has lots of stories, and he'll share them in rapid-fire fashion if he's got an audience. In the span of a few Caltrain stops, we heard a breadth of knowledge spanning from how in the height of the industry, some trains used to go through 10 switches apiece; to what a terrifying experience it is to be hooked up to two Caltrain engines at 100mph; all the way to how much of a pain it can be to deal with the W32.Blaster computer worm. I made a point to give him my card (and he gave me his) before getting off the train, which is when he mentioned that he had also spent some time in the film industry, and that his nickname "Dangerous BoB" came from Stephen Spielberg himself. From his IMDB page, he's listed as an assistant property manager for the original Back to the Future, as well as Parts II and III. It's always fun to meet interesting people. again.. be nice to contact him. i have a surfing name question. we rode together for years. had a neat trivia game we played - 5 of us. Bob is awesome guy and be was in fact the assitant prop director for Back to the Future. They filmed a lot of it at my high school in Whittier, California. One night me and a buddy bellied in and snuck past the security guards and made it all the way to where they were filming. After a while security caught us but Bob said "they're with me" and we became friends. We were allowed in each day after that. He even gave me the parking and site directions in LA where they were filming. I was 16 and convinced my mom to let me out of school and spent the whole day on location. He is one cool dude.